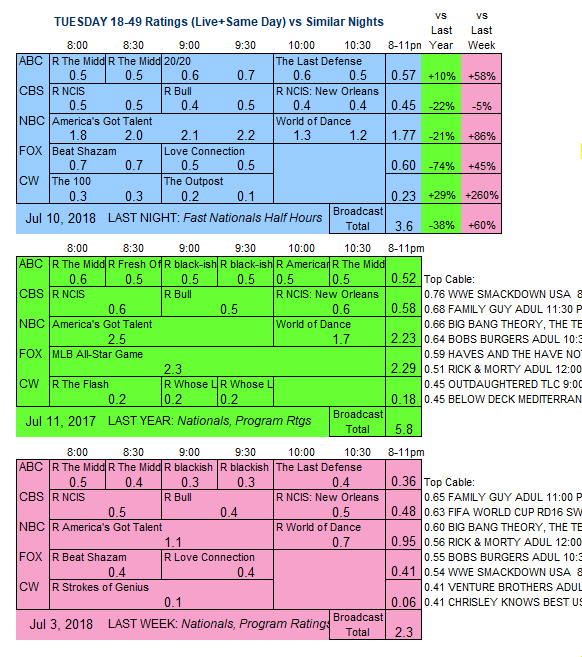 Last week’s holiday eve was heavy on reruns, so comparisons are to 2 weeks ago unless otherwise noted. NBC: AMERICA’S GOT TALENT gained 0.1 to 2.1, and WORLD OF DANCE was steady at 1.3. FOX: BEAT SHAZAM (0.7) and LOVE CONNECTION (0.5) held their numbers. 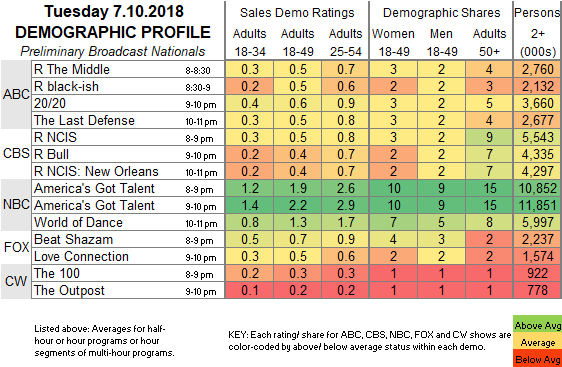 CW: THE 100 moved down to the 8PM slot and rose 0.1 to 0.3, followed by the premiere of THE OUTPOST at 0.2. ABC: A special 20/20 was at 0.6, and THE LAST DEFENSE was up 0.1 from last week to 0.5. The night started with reruns at 0.5/0.5. Tonight, CBS introduces the competition series TKO: TOTAL KNOCK-OUT.